For an average Lagosian who spends an unhealthy 5-6 hours every day commuting to work 6 times a week, I didn't have the time to check out Falz' "This Is Nigeria" video even though it went viral on my social media of choice, Twitter, within hours of release. I’m far too busy to bother about TV these days. My lukewarm stance like that of the typical too-busy-to-enjoy-the-little-joys-of-life of the critically acclaimed "This Is Nigeria" took a rather curious turn when Islamic group, MURIC, gave Falz a seven-day ultimatum to drop the video or risk being sued. What could Falz have done so wrong here to draw the reproach of a religious group I wondered as I typed in the search bar of every Nigerian's best friend, the Google app. Permit me to put the little matter of MURIC's petulant act of class-captaining for Nigeria's children of anger while I hype Falz small. The video was controversial but marvelous! Falz should be getting awards, not tempestuous reproach from MURIC or anybody else, for dropping such a great body of work. It's the most accurate depiction of the Nigerian society in ages! A satisfyingly great satire. 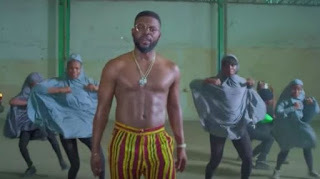 The truth didn't sound sweet when the blunt President Buhari said Nigeria has a corruption problem, Falz couldn't have summarized the problem better in song form. Back to MURIC. The religious body said "This Is Nigeria" is a misrepresentation of the Fulani tribe and the plight of the Chibok girls. MURIC is wrong on two grounds; there were Christians among the Chibok girls, not Muslims only and Falz didn't slander anyone. He just said it the way it is, the Nigerian society in its quest for acquiring materialism isn't paying attention to what matters. Truth and morals are moonwalking into the morass while Nigerians praise-sing those who have money to throw around. That penchant for illicit wealth and get-rich-quick schemes is driving Nigerians over the precipice, morals have taken a backseat while deceit is running the show. Falz shook tables Nigerian pastors, imams, politicians, public office holders, mummies, and daddies refuse to shake to bring society back to its senses. He didn't take an isolated aim at Islam, he drove the message home with Christians (the white-garment denominations particularly) too, drug abuse aka science students wasn't left out, Yahoo-Yahoo boys, police brutality wasn't spared either. We didn’t hear anyone threatening anyone over the video. MURIC needs to take its sanctimonious magnifying glass somewhere else. There's nothing to see or morally shred here. As they say on the streets, Falz odi ok! What are we even talking about here? Where was MURIC's misplaced outrage when the Chibok girls were snatched? What ultimatum did MURIC give the Federal Government when the Dapchi girls got snatched? Where was MURIC's statement following the murder of innocent Nigerians following the murder of hundreds of Nigerians all around Nigeria? "This is Nigeria" is a wake-up call to society in general, not a hate video as being projected by MURIC. Someone needs to take a chill pill. Islam in Nigeria has a deeper problem than girls in hijab dancing shaku-shaku, that's what MURIC should be addressing. Like twitter user, @Olajvde, tweeted on the controversial MURIC sanction, "If Falz comot the video, we go upload am back." No one could have put it better.